Andy Garcia's directorial debut is a flawed and overlong but nonetheless watchable drama with strong performances, a superb soundtrack and bizarre appearances from Dustin Hoffman and Bill Murray. Directed by Andy Garcia, from a screenplay by renowned Cuban novelist Guillermo Cabrera Infante, The Lost City stars Garcia, Enrique Murciano (from Without a Trace) and Nestor Carbonell (from Lost) as Fico, Ricardo and Luis Fellove, three brothers whose family loyalties are torn during the Cuban Revolution. 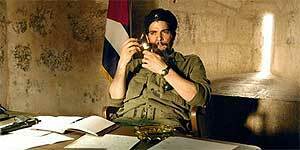 While Ricardo heads to the mountains to fight alongside Che Guevara (Jsu Garcia), Luis embraces the cause and operates as a covert revolutionary, eventually staging a daring attempt on Batista's life. Meanwhile, Fico continues to operate his successful nightclub, fending off lucrative offers from gangster Meyer Lansky (Dustin Hoffman) and hanging out with his wise-cracking, enigmatic friend The Writer (Bill Murray, supposedly representing the voice of the author). However, when he falls for Luis's wife Aurora (Ines Sastre) and she in turn is adopted by Castro (Gonzalo Menendez) as one of the widows of the revolution, Fico finds himself with a difficult decision to make. Despite its flaws, The Lost City remains watchable, thanks to strong performances, stunning cinematography (courtesy of Emmanuel Kadosh) and a terrific soundtrack by Garcia himself. Murciano and Garcia are particularly good, while Dustin Hoffman's two-scene cameo as Meyer Lansky is an all too brief treat. That said, the film is undeniably patchy in places; for one thing, it's at least 30 minutes too long and drags horribly in the middle section. In addition, as enjoyable and as weird as Bill Murray's performance is, it feels like it belongs to a completely different film. Indeed, it often feels like The Lost City can't quite make up its mind as to what it wants to be: a family drama, a love story, a historical epic, a musical or even, at times, a black comedy. In short, The Lost City is something of a mixed bag, but the performances, soundtrack and cinematography just about make up for its flaws.